CAREER HIGHLIGHTS: Started in 1997 as an in-house consultant at BMW before taking on various responsibilities including fuel cell technology and batteries. 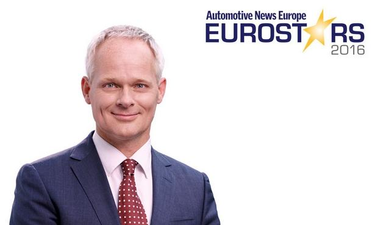 He managed the series development of information and communications systems from 2004 until 2009, when he was named vice president for strategy and innovation within BMW's development arm. He took over his current position this year. REASON FOR WINNING: Grote has been successfully imagining what the mobility needs of premium car buyers will be in the future. The theoretical physicist helped to bring many of the high-end connectivity and convenience features offered in the current 7-series flagship to market. This includes a system that recognizes hand gestures that can be used to decline a call or make the radio volume higher, as well as the ability to park the 7 series from outside the car using a key fob.